is there any way to improve the appearance of the procedural Elliptical (E) Galaxies? They all basically look the same - a yellow spheroid with a gradient from the centre to a very sharply defined edge, and they look very unrealistic. At the very least is there a way to soften the outermost edge so they fade more gradually into the space around them? Maybe they could even be rendered more like the central bulges of spiral galaxies but without the arms and dust? Or instead of having a gradient that always increases to a point in the centre, it could instead increase to a specific (random?) radius so they look a bit more varied? Is this going to be improved in 0.9.9.0 at all? And would there be more galaxy types in that as well? I would wait for Space Engineer to say something for a full answer, but from what I know, the only thing he is planning on working on in terms of galaxies is making them raymarched. I assume that would mean the galaxy dust will be much better looking. In the mean time, I would suggest this addon that has 82 new galaxy models. Thanks, I'll check that out. It seems the ellipticals aren't rendered using models and textures (unlike the Spirals), does that mean it's impossible to modify any scripts or cfg files to alter their appearance? As another option, could Ellipticals not be rendered the same way as the central bulges of spiral galaxies? Or even just with their own models and textures like spiral galaxies? Source of the post Al the pictures of Elliptical galaxies that i've seen fade out into the surrounding space and don't have that edge. In computer simulation, everything must have a border. 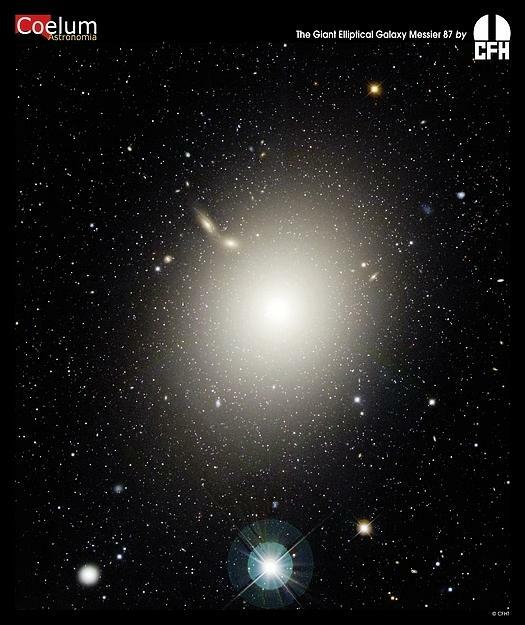 Elliptical galaxy model is not an exception. 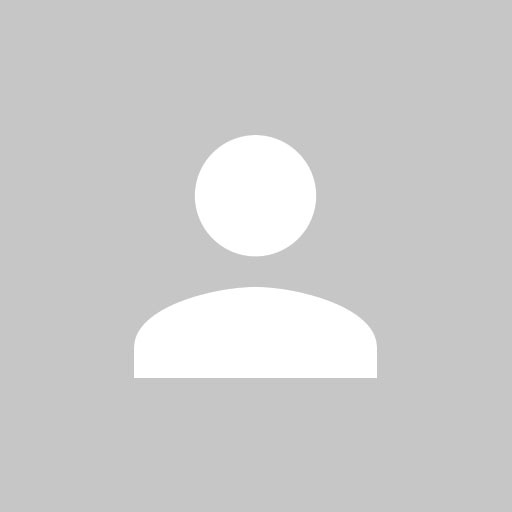 This is because how original hi-dynamic range photograph was converted to lo-dynamic range jpeg image. 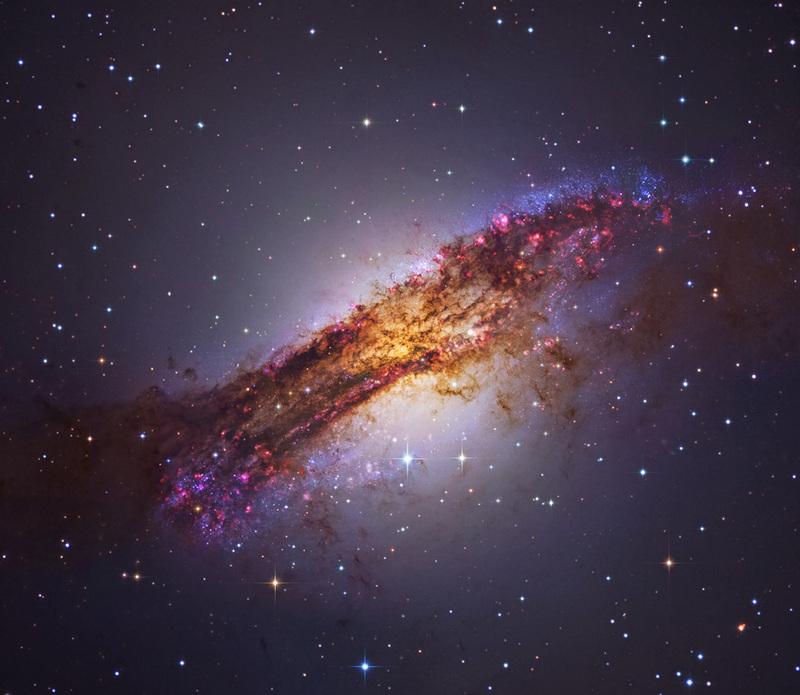 Telescopes takes photos using 16- to 24-bit depth CCD matrices, and astronomers uses all available data to make measurements. For public release, photos must be converted to 8-bit depth jpeg/bmp/png/whatever images to be able to display them on monitors. Some exposure conversion is used for this. Any photographer who is familiar with HDR photo knows this. Source of the post Though granted I don't know how much of that is due to photo exposure. But they do just look 'artificial' to me in 0.9.8.0 at least - too mathematically defined. Center of the galaxy is indeed very point-like, because its surface brightness is thousands times larger than the brightness of a middle parts of the galaxy. 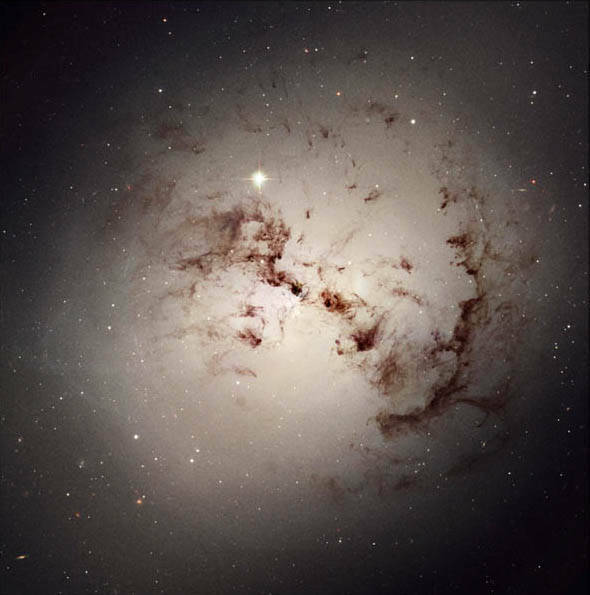 While observing galaxies through telescope with an eye, you usually see only the central parts of the core, which looks like a fuzzy star. Source of the post As another option, could Ellipticals not be rendered the same way as the central bulges of spiral galaxies? Or even just with their own models and textures like spiral galaxies? A custom sprite model for E galaxies can be created in the same way as for spiral galaxies, there is a tutorial. But 99% of E galaxies have only bulge, so De Vaucouleurs model is enough for them; it also takes no memory and has 100 times faster rendering. Some of the first versions of SE had all E galaxies implemented using sprite models, but the result was not very good. The analytical De Vaucouleurs model is much more realistic. I get that everything must have a border but my point is that in this case I think it's too sharp. Stars don't just stop sharply at the edge of a galaxy, their number density drops gradually and the galaxy fades out into space. 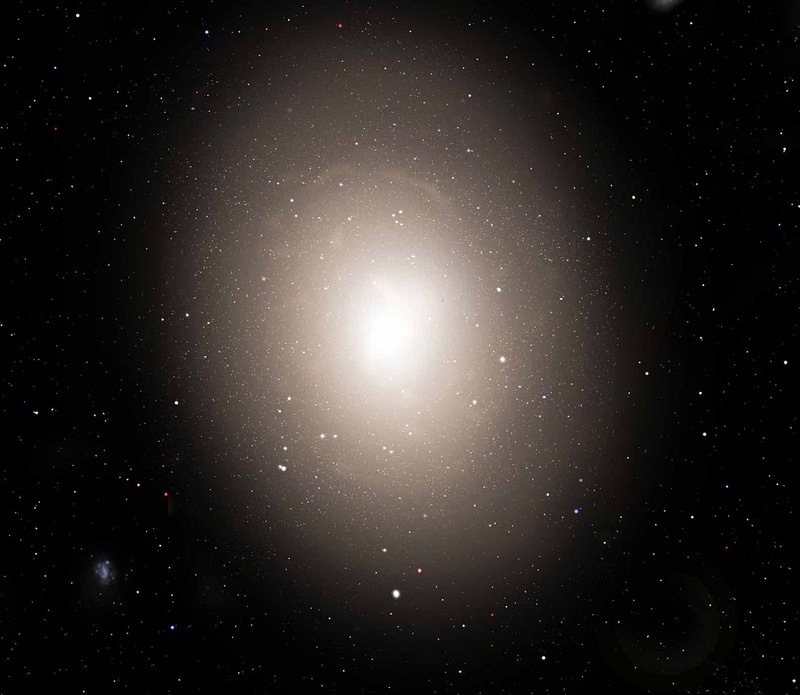 In 0.9.8.0 the edge of an elliptical is far too sharply defined - maybe the stars still do fade out gradually there but that isn't duplicated in the appearance of the elliptical galaxy from outside and that's what makes it look so unrealistic. As for the rest, fair enough - though I think there could still be some variation in colour perhaps. Currently all the ellipticals are the same yellowish colour - I realise that they're usually made of older stars but there is some variation and it'd be nice to see ones that are a little whiter or bluer perhaps? Look, this is what I mean (ignore the core, this is just a quick thing I made with the gradient fill in photoshop. I'm talking about the edge of the circle here). I've had a similar visual problem in my own games, with particle sprites in my case rather than galaxies. It seems to originate from the brightness / opacity having a linear as opposed to quadratic or exponential falloff. Picture if you will a graph of how dense the galaxy is at a given distance along its radius (because I'm too lay to post actual graphs). If the falloff is a straight line, the human brain will be able to easily spot the edge where it suddenly reaches zero and stops decreasing, and we will perceive that edge as a hard boundary. If, on the other hand, the falloff is a curve that reaches zero very gently, the edge will be much less clearly defined and will seem softer and more natural as Ganymede has been requesting. 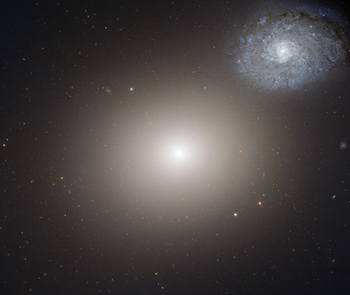 It is worth noting that if such a change is made, the elliptical galaxy "models" themselves will likely need to be enlarged a decent fraction to make up for the more diffuse peripheries and denser central areas. I've noticed that really dense atmospheres, particularly of massive stars, are way too sharply defined and appear graphically glitched out as I move out and into it, especially when viewing the horizon near the surface. Same phenomena at work I guess?